Not a lot done today. Just added some new options in the game relating to opening up new lines of conversation through object discovery. 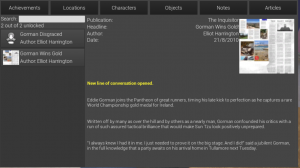 When a new article or object is discovered and examined, part of the popup text will indicate if the object has unlocked new dialogue. The challenge then is to be able to skip directly to new dialogue when re-engaging in conversation with a character (rather than going through all the old stuff) – I have a bit of that done, but it may need a more flexible solution. Otherwise just added some thumbnails to a character and an object within the achievement/notes popup. I’m going to keep an online public log of my PhD activities from now on. I’ll document major game design decisions, research done, etc. Today I had a quick look at the game Elegy for a Dead World, which I picked up cheaply as part of a Humble Bundle. There’s something in it that intrigues me – in my serious game, I expect my main protagonist (a freelance investigative journalist) will “write” weekly articles for a magazine. In the Elegy game, the player does literally write some of the words. Can I incorporate that kind of mechanic into the game? Or will the words in my game be predetermined and more like jigsaw pieces. Just more food for thought. Cola contains caffeine, which is a stimulant. According to the 2016 WADA Monitoring Program, it is not a banned substance, but one which is being monitored by WADA to determine if it being misused overall. 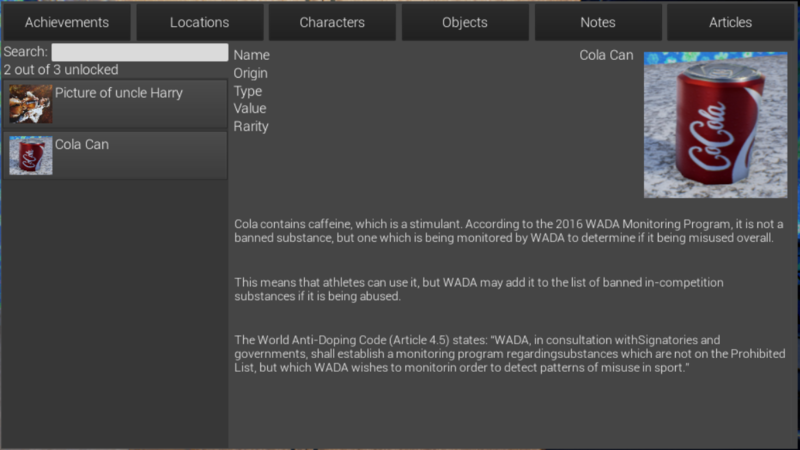 This means that athletes can use it, but WADA may add it to the list of banned in-competition substances if it is being abused. I suppose it is educational, fulfilling one goal of the game, which is to transfer knowledge about the rules and regulations of doping… but it’s a bit expository or “tell not show”. Would it sink in with the player? Some pre- and post-testing of the players’ knowledge would of course determine that. 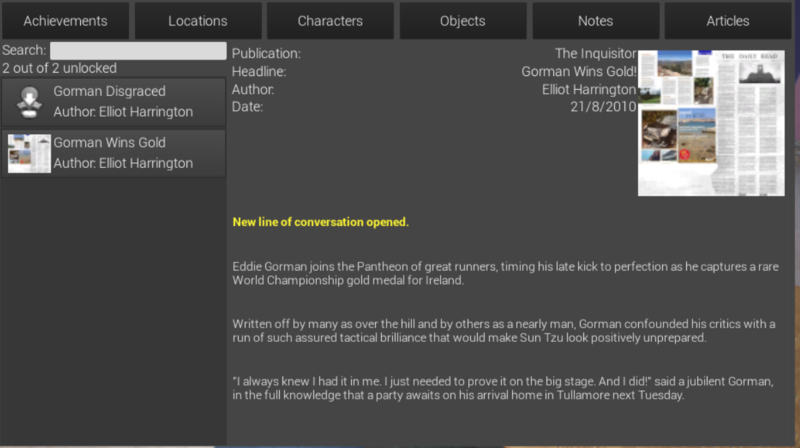 Eddie Gorman joins the Pantheon of great runners, timing his late kick to perfection as he captures a rare World Championship gold medal for Ireland. Written off by many as over the hill and by others as a nearly man, Gorman confounded his critics with a run of such assured tactical brilliance that it would make Sun Tzu look positively unprepared. “I always knew I had it in me. I just needed to prove it on the big stage. And I did!” said a jubilant Gorman, in the full knowledge that a party awaits on his arrival home in Tullamore next Tuesday. These articles are a backstory device showing, in this case, the rise and fall of an athlete. Reading some of the articles will trigger questions to ask the NPCs (non-player characters) in the game.